One more bean post….we made a huge batch! Refried beans were a special treat growing up. My Uncle Fernando rocked these out with bacon grease and chopped jalapeno every time we went camping. My Uncle Mando’s are legendary! I hope he’ll share his recipe soon. The traditional recipe calls for lard…tasty but not heart friendly. My version is much easier on the arteries but just as yum. I promise you won’t miss the bacon. Plus these are actually good for you! I’m going to make these for my Unlces next time I go home and hope these get added the family cook book. If you’re using canned beans, drain and rinse the beans. Slice the chilies in half and remove the seeds and ribs. Add the EVOO to the pan and heat for 30 – 60 seconds. Add the Serrano chilies, skin side down, and fry until the skins start to turn golden brown. Add the beans, cooking liquid (a.k.a – bean juice) or stock, liquid smoke, salt and pepper. Start to mash the beans. Be extra careful not to mash the chilies….they’re only there to infuse the bean with a bit of heat. Cook until the beans become thick (approx 8 – 10 minutes). If they become too thick add a touch more liquid. Taste and adjust the seasonings if necessary. Serve hot and topped with cheese! Try queso fresco, cotija or Chihuahua cheeses. Of course cheddar is tasty too. I last served these with quesadillas but they make a great side to any Mexican style dish. We just LOVE black beans and they’re a fabulous substitute in this recipe. 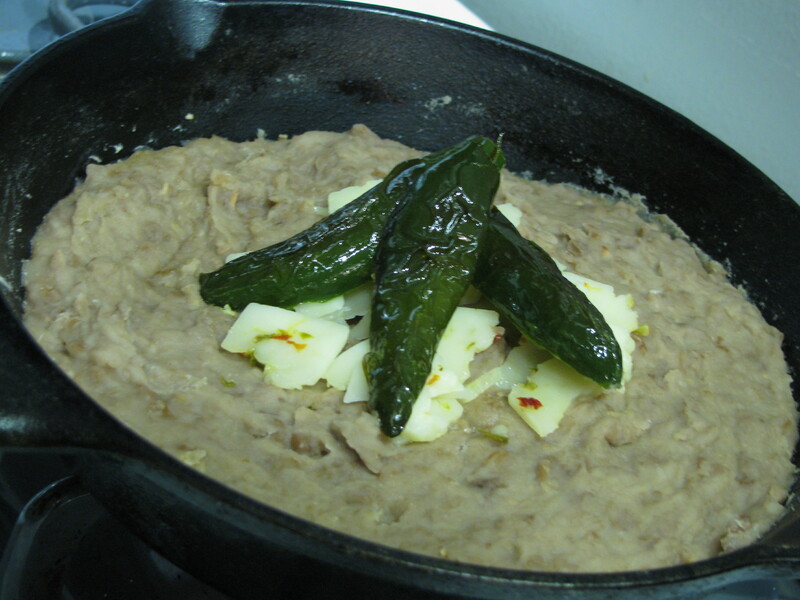 Traditional refried beans use manteca (lard) for the grease. It’s not healthy but dang….it’s good! You could also use bacon grease if you have it on hand. If you use either…omit the liquid smoke. Can’t find serrano chilies? Jalapenos would work just as well. If you can’t get fresh peppers, a pinch of cayenne to spice it up works too. Ohh I’d love to sit in on your family meals, I bet they would be outstanding! Great recipe….but I know I’d add the bacon lol! I agree…but trust me when j say the liquid smoke really does fool your taste buds into thinking their tasting bacon. It’s so good! It adds jut enough heat and a hint of sweetness. For the love of refried beans! I must admit black (refried) beans are my favorite. I’m gonna keep my eyes peeled for “Uncle’s” recipe! I’ll be sure to post their recipes when I get my hands on them.